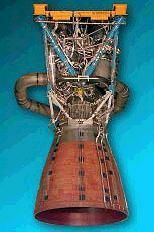 Rocketdyne LOx/LH2 rocket engine. In production. First new large liquid-fueled rocket engine developed in America in more than 25 years. Powered the Delta IV booster. First flight 2002. Status: In production. Date: 1998. Number: 9 . Thrust: 3,312.00 kN (744,567 lbf). Unfuelled mass: 6,597 kg (14,543 lb). Specific impulse: 420 s. Specific impulse sea level: 365 s.
In the 1990's Rocketdyne was simultaneously developing the first two new large liquid-fueled rocket engines in the United States in more than 25 years. One of these - the RS-68 - would power the Delta IV evolved expendable launch vehicle (EELV) being developed by The Boeing Company. The bell nozzle RS-68 is a liquid hydrogen-liquid oxygen booster engine that develops 650,000 lb. of sea level thrust. The RS-68 utilizes a simplified design philosophy resulting in a drastic reduction in parts compared to current cryogenic engines. This design approach results in lower development and production costs. The engine can be throttled to 60% of full thrust level. Designed for booster applications. Gas generator, pump-fed. Engine: 6,597 kg (14,543 lb). Chamber Pressure: 95.92 bar. Area Ratio: 21.5. Thrust to Weight Ratio: 51.2. RS-68 Regen Rocketdyne LOx/LH2 rocket engine. Design concept -2004. Upgrade to basic RS-68 for Delta IV Heavy growth versions. Would use a regeneratively-cooled expansion nozzle, allowing it to run hotter, with higher thrust and specific impulse. RS-68B Rocketdyne LOx/LH2 rocket engine. Design concept -2004. Upgrade (details not specified) to basic RS-68 for Delta IV Heavy growth versions. RS-800 Rocketdyne LOx/LH2 rocket engine. Design concept -2004. New high-thrust cryogenic engine for Delta IV Heavy growth versions. Country: USA. Launch Vehicles: Delta 4M+(4,2), Delta 4M, Delta 4H, Delta IV Small, Delta 4M+(5,4), Delta 4M+(5,2). Propellants: Lox/LH2. Stages: Delta RS-68. Agency: Rocketdyne.